DeCamp and I were discussing her newest work, Urban Renewal, which opens this week as part of FIAF’s Crossing the Line Festival, supported by the Hermès Foundation’s New Settings program. Urban Renewal is just one of several pieces in this year’s festival that explores issues of community and politics, through a study of deCamp’s own experience growing up in Hyde Park, Chicago in the 1960s. In 1963, when deCamp was just seven years old, her childhood home—“a red-brick row house, the sort you’d love today”—was leveled as part of an urban renewal scheme responding to transformations in the neighborhood, originally conceived as an urban village for the University of Chicago. But the plans for the transformation were stopped in their tracks, and for decades, the block on which deCamp’s house had stood remained vacant, until recent changes in the neighborhood, which counts President Obama as his family as residents, led to new use as an open space. But it was that image of empty, disused space that kicked off deCamp’s process for the show. In the late ‘70s, deCamp made her way to New York City after studying at Sarah Lawrence, where she worked in the downtown scene as a dancer. She made her premiere with Douglas Dunn at BAM, and spent a number of years in the milieu around Merce Cunningham, where she served as an assistant to Charles Atlas as well as performing with choreographers like Charles Moulton and Karole Armitage. By the mid- to late-80s, though, deCamp’s practice was changing. First, she decided she wanted to speak in performance again, and began working in hybrid performance and theater with the likes of the Builders Association, John Jesurun, and Richard Foreman. As a creator, though, she found herself drawn to a sort of documentary theater practice in which she, as an artist, served to embody and explore socio-historical research. “I decided that my work—despite a completely allergic reaction to solo work, I hated solo dance, theater, blah blah blah—would be solo work, but wouldn’t be about me,” she explained, noting that this was somewhat out of the mainstream in the era of identity politics and solo performance emerging from the downtown scene. Her first piece was Luteplayer (1991) which explored the tension between high and low art forms through Caravaggio’s painting of the eponymous musicians. 1993’s Ladyland saw her tackling the experience of Jimi Hendrix’s exploitation by the music industry, through the perspective of texts drawn from a dozen real women from Hendrix’s life. And in 2000’s Out of Breath, she explored iconic ’60s actress Jean Seberg’s persecution through Seberg’s own words, both as an actress and an interview subject. Instead of researching sources, looking at photos, talking to family, she spend several months intensely engaging with her own subjective experience, stopping only when the trauma of the 9/11 attacks, which she watched through her apartment window, pushed her into new psychic territory. Several years later, when deCamp was in an MFA program at the Rennselaer Polytechnic Institute, she began building the piece with video artist Joshua Thorson, and an early work-in-progress version was shown at EMPAC. In the piece, deCamp tells several intersecting stories. The first is her own personal narrative, reconstructed through her writings. The second is the history of the place now known as Chicago, from prehistoric times through its settlement by Native Americans, their displacement through European colonization, the construction of the city, and the urban transformation wrought by the Great Migration, including the construction of the now-notorious housing projects. And third is the political-intellectual history of urban design and planning, from the origins of “imminent domain” from the Magna Carta through European common law, to the history of colonial architecture, Baron Haussmann’s transformation of Paris, and Le Corbusier’s modernist design. 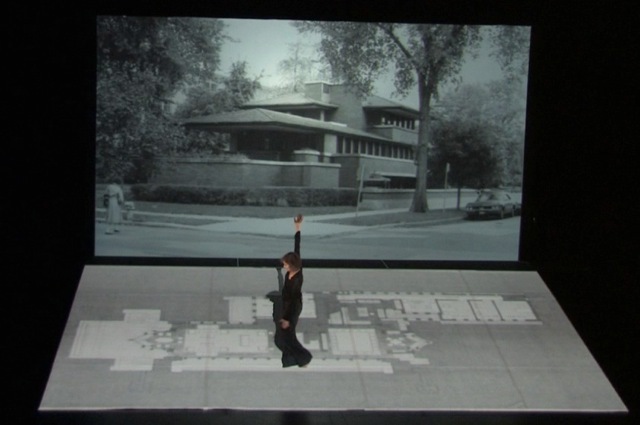 The three narratives are mapped geographically during the performance on multiple planes through the video design, which incorporates hand-drawn animation, creating a polyvalent performance space inhabited by deCamp as she intertwines the narratives until they intersect in 1963 in that vacant lot. “I think my pieces are about those without power and how they’re functioning within a given invisible system,” deCamp said of her work overall. Like previous pieces, Urban Renewal explicitly plays with the intersection of the personal and the political, both fully indulging the power of personal narratives while placing them in a broader cultural and political context.